I’m a worrier. And if it’s not too boastful to say so, I’m actually pretty good at it. I can worry about small things, like traffic and weather and what’s for dinner; and I’m gifted at worrying about the big things, too, like terrorism, disease, and the distant future. If I really let my mind loose, I can cycle through my list of worries all day long until I’m emotionally exhausted and admittedly crabby, so I work really consciously to not let my mind loose. 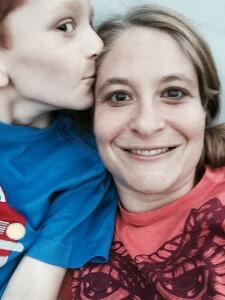 Becoming a parent gave me a zillion (a conservative estimate) new things to worry about, and becoming a parent of a child with a disability made the quantity of regular parenting worries look downright manageable. With Nate, I worry if he will be safe out in the world; if he has stories stuck in his head that he can’t share; if he will “moon” the audience during a school play; and if he’ll “love” the cat just a little too hard, and get clawed across his face right before picture day. Like I said, I’m really good at this worrying thing. Nate’s getting older though, and we’ve been at this for a while now. As 2015 winds down, and I’m taking stock of where we are as a family, I’m realizing there are things I used to spend a lot of time worrying about that just don’t bother me anymore. Those worries have of course been replaced with new worries, but it feels good to see how far I’ve come. It’s no secret that adding a child to a relationship can make things hard, and adding a child with a disability can make them even harder. Some research has shown that couples that have a child with a disability have a 70-80% chance of getting divorced. During Nate’s early years, when his behavior was most extreme and his delays were emerging, I spent a lot of time worrying if our marriage could withstand the pressure. We were bickering more and both struggled with grief so it seemed more possible than ever before that we’d crumble. I’m proud to say that’s not what happened. Instead of crumbling, we pulled closer. We developed compassion for each other and the hard situation we are in, and we are able to muster empathy when the other has reached a breaking point. We can be generous to each other because we know how hard we’re both working, and we are forgiving when the other is irritable or short-tempered. It turns out that being Nate’s parents strengthened our bond rather than eroding it. #2: Will our other son’s life be ruined because he has a brother with a disability? Will he look back on his childhood as a happy one? Will he grow up resentful of the extra time and attention his brother demanded? Will he be lonely and isolated because Nate can’t play with him like a typical brother might? It hasn’t always been easy, and through the years Isaac has occasionally struggled with having Nate has a brother. However, the fact is that I have two boys who love each other tremendously and have found their own ways to connect. 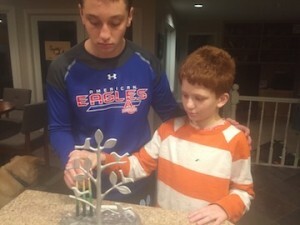 Isaac has a compassionate kindness and empathetic maturity to him that you don’t find in most 14-year-old boys, and he can demonstrate a level of patience and affection towards his brother that does a mom’s heart good. He occasionally struggles with being embarrassed by Nate’s unusual behaviors but so do I so I accept that. Isaac will never have the kind of brother I wanted for him, but it turns out he has the exact brother he wants. #3: Will our extended family accept/understand/love Nate? Playing with and caring for Nate isn’t always intuitive. His language is delayed, his behavior can be challenging, and his social skills are still emerging. I used to worry that Nate’s grandparents, aunts, uncles and cousins would never be able to bond with him and love him because of how hard it can be. It turns out I was grossly underestimating Nate’s grandparents, aunts, uncles and cousins. They love Nate wholeheartedly and enthusiastically. They reach out over and over again until he responds, and they don’t give up. They accommodate his needs and are comfortable modifying activities to make sure he can participate. They celebrate his successes and don’t see him as someone who needs to be fixed. Most importantly, they love him for exactly the person he is right now. He gets all the attention, consideration, and accommodations from his family that a boy could ever ask for. He is always included and incredibly loved. #4: Can I do this? Nate’s first few years were exceptionally hard. They were labor intensive, busy, stressful and tremendously scary. In the years after he was born, I was called upon to not only be Nate’s mom but also to be an expert in early intervention, special education advocacy, sign language, ADHD, behavior modification, and health insurance. I needed to apply for state services, find gadgets designed to keep him in his seat belt in the car, and find pajamas he couldn’t peel off after I put him to bed. There was so much to know and so much work to do, and I wasn’t convinced I was up for the job. Amazingly, after a few years of self-doubt, it finally occurred to me “I know I can do this because I AM doing it.” Nate was growing up, and I was managing to gather the knowledge and expertise I needed along the way. I slowly built the confidence in my own ability to handle each new situation, and even learned I can do it with some joy, humor and enthusiasm once in a while! Self-doubt of course still creeps in but most days my confidence is stable. I know I can do what my son needs me to do and nothing will stop me from getting the job done. #5: Will he be okay? The meaning of this question has changed for me over the years. Will he be okay? used to mean, Will he catch up to the other kids and be normal? I agonized over that. I measured his progress against every single kid we crossed paths with, and microscopically studied his every move for evidence he was catching up. But he wasn’t catching up, and every comparison made that point more clear. Luckily, at some point Will he be okay? evolved to mean Will he be safe, happy, fulfilled, and loved? When my idea of being “OK” changed I found the worrying changed too. Accepting Nate as he is, with no repairs needed, and instead focusing on providing him with what he needs to thrive, has given me something to focus on and work towards. Nate will probably never catch up but if this mom has anything to say about it you better believe he will be the safest, happiest, most fulfilled and most loved kid he can be. As a champion worrier, one of my favorite quotes I fall back on is from Mark Twain: “I’ve had a lot of worries in my life, most of which never happened.” To back this up, research has shown that 85% of the things people worry about never happens. Actual research. What a relief! Knowing that my five biggest worries about Nate didn’t pan out is encouraging, and helps me cohabitate more peacefully with my current set of worries. Of course the worrier in me says that each current worry has a 15% chance of coming true, but I’ll just worry about that another time. Right now I have a funny, stubborn, red-headed angel to take care of, and he needs me.